Hi friends! Welcome to my Friends With Flair post! I'm still blogging cards from WCMD, nearly a month ago! Wow, I'm behind! 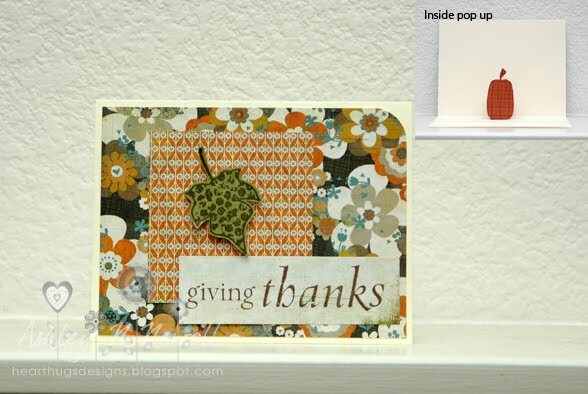 Ok, today I'm sharing a pop-up card with you. I don't usually enjoy doing technique challenges but you know, I was trying to do all the challenges. I didn't succeed but you know, I gave it a go. So, here's a very simple pop-up card. I do think that I will start making more pop-up since it was super fast. I think that the kids would enjoy it in birthday cards. great card and can't wait to be bombarded. How cute!! That's one of the challenges that worried me, but you really pulled it off. My GOSH! I could hardly scroll down to see your card! Your babies are so beutiful! Your card os OK. LOL Just kidding it is beautiful too. but your kiddos in that heart are REALLY perfect! Such a beautiful fall card!!!! stunng card Ashley.. I love it!! What a fun card! Love how this turned out. Fabulous pop up card! I love the leaf on the front! And the dp is awesome! Have a great weekend Ashley!